Are you looking for an experienced installer of patio enclosures in the Milton, Florida, area? If so, turn to Majors Home Improvement. Since 1997, we have served homeowners throughout the area, providing high-quality products that improve the comfort, functionality, and appearance of their homes. Our team works hard to deliver top-notch service from beginning to end – from the initial consultation to installation and beyond. In doing so, we’ve earned an A+ rating with the Better Business Bureau. Sunrooms – TEMO sunrooms are durable, energy efficient, and available in studio, cathedral, and California styles. They are made from sturdy extruded aluminum, a material that has impressive durability. Screen rooms – TEMO screen rooms are also constructed of extruded aluminum. Additionally, they come with ventilated screens, vinyl sashes that block harmful UV rays, and thermal roofs. 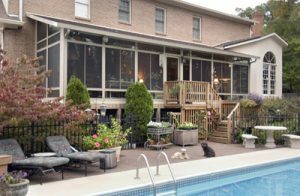 Choosing Majors Home Improvement for a patio enclosure also means that you can count on a flawless installation. Your sunroom or screen room will be expertly installed by our team of factory-trained technicians. They will be respectful of you and your home throughout the project’s duration, providing you with Red Carpet Service. If you’d like to learn more about the patio enclosures we install in Milton, FL, and surrounding cities, contact Majors Home Improvement today. When you do, we’ll schedule a complimentary consultation at your home.